It’s easy to assign multiple households to a single InvestorView username. There are a number of reasons that advisors may want to do this. For example, if an advisor is managing multiple households for a family and each of those households needs to be accessed by the primary trustee. In order to accomplish this, simply choose each of the ClientID’s (your AssetBook household name), when registering a user. From the main client list in the Administrator portal, click the Register button. Fill in the email (this is the username) and Display Name (which is how your client will view their own name in the portal). Next, pick each ClientID to be attached to the username by picking each client from the drop-down list. The result will be that when the user log’s into the portal, there will be links to each household that is linked to the user. You can also add a household(s) to a username that has already been registered. From the Administrator portal, click Clients, Registered Users and then the Clients tab. Next, click the small arrow just to the left of your registered user, and then Update. Finally, just add the households that you wish to assign to this username. Save and you are all done. 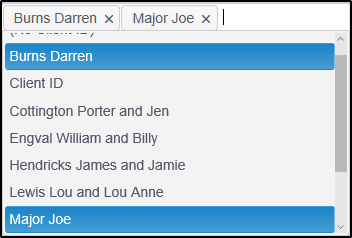 Watch this blog for a follow up post on how you can also add multiple usernames (or emails) to a single household. Posted on November 7, 2016 Author Rob MajorCategories Did You Know?